It is critical to inspect all hives on a regular basis, especially the brood. This is an important management practice to determine the presence or absence of many established pests and diseases within Australia. It is also an important precautionary measure for beekeepers to identify any exotic pests that may be in their hives, such as the exotic Varroa mite. The following are guidelines for every beekeeper to follow when inspecting hives. Examine the brood and colony at least several times a year during spring, summer and autumn. Make sure that the circumstances are suitable to inspect the colony. For instance, do not start the inspection if the weather is likely to be wet or cold, or if there are people or animals in the vicinity. Make an assessment of the level of activity at the entrance of the hive. Observe whether honey bees are flying, if there are any dead honey bees, or if honey bees are bringing in pollen. Keep records of your inspections and write down any occurrence, or suspicion, of disease. If anything suspicious is observed report it immediately to the Exotic Plant Pest Hotline 1800 084 881. Always be calm and methodical when working with hives, and try to avoid any sudden or sharp actions. Remove the hive lid and any supers and place them to the side of the hive. Use the smoker sparingly to control the honey bees. Smoke the honey bee colony from the top down, as smoking from the bottom will drive the honey bees upwards. If the hive has a queen excluder, carefully remove it with the aid of a hive tool. Clean up any brace/burr comb or propolis from the queen excluder or on the top of the frames and place into a sealed container that can be taken away with you. Do not discard this on site as honey bees could rob this material which could then spread pests or diseases. Remove an end frame and place on the side of the hive to give more space to remove a centre frame without damaging the honey bees. Remove a brood frame (without the queen bee) and shake most of the honey bees back into the hive or at the hive entrance, leaving the brood comb clear for inspection. Hold the frame by the top and inspect the brood thoroughly. Look for symptoms associated with established pests and diseases of honey bee colonies. Look for any queen bee cells on the comb surface and bottom side of the comb, and if present, remove to reduce swarming potential. Repeat this for all brood frames. Place combs back in the same sequence and orientation as they were at the start of the inspection, unless you have planned to manipulate the combs for a management reason. Make sure that the frames are tightly pushed together to provide the correct bee space. Record what you observe and note any pests and diseases that you have identified. Look at possible control or management options. 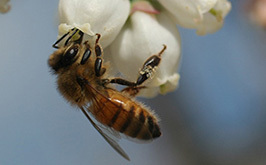 When inspecting any hives, it is important to always be aware of the possibility that they could contain exotic pests. Exotic mites, such as Varroa sp. pose a constant threat to Australia’s honey bee industry and beekeepers are in the front line for early detection. Early detection and reporting improves the chances of containing and eradicating any new pests. You should include checks for external parasites in routine inspections of hives. See the Surveillance for exotic pests page for more information. For more information about monitoring for Varroa and determining mite colony threshold levels, download Daniel Martin’s Churchill Fellowship report.